Miew is a high performance web tool for advanced visualization and manipulation of molecular structures. It covers a wide range of applications in chemistry, pharmacy, biology, bioinformatics. 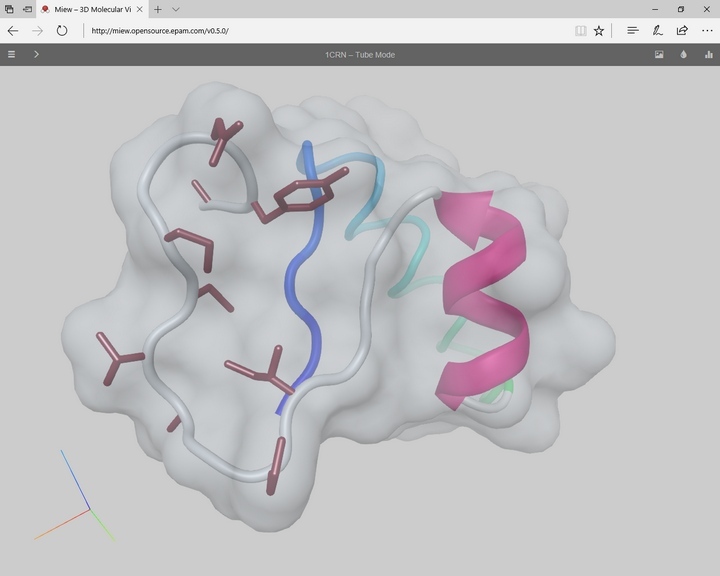 Scientists and researchers can examine molecular structure or properties, visualize ligand docking and protein folding, analyze mutations, and display results in a friendly interactive environment. Miew provides a full-featured set of tools for 3D visualization and editing of small molecules as well as large molecular complexes, including means to view, analyze, and modify the 3D structure of a molecule. It works as a standalone HTML5 web application or integrates as a component into your web pages. The latest versions of WebGL-enabled desktop (Chrome, Firefox, Safari, Opera, Edge, IE11) and mobile (iOS, Android) browsers are supported. Miew is a free and open-source software. Try the Miew demo online. Miew is under active development. You can post us your comments and suggestions and get timely replies from the developers’ team. You can fetch proteins right from RCSB by their PDB ID, or retrieve 3D conformers of simpler chemical structures from PubChem. If you’d like to use a different server you may specify a fully-qualified URL of the data file to load. You may also wish to browse to a local file on your computer. The data could be atom positions (PDB, CIF, MMTF, XYZ, SDF, CML), electron density fields (CCP4, MAP, MRC, DSN6), or atom trajectories. The list of supported file formats is growing. Miew is capable of displaying a molecule using one of 10+ different modes including but not limited to Balls and Sticks, Cartoon, Surface. Various coloring algorithms (by element, secondary structure, hydrophobicity, etc.) can be applied to each mode increasing the number of combinations. User is free to combine different representations in one picture if that’s what you need for your research. Just pick atoms and/or residues with a mouse or use the specially designed selection language to extract certain parts of the complex as a separate representation. Simplify the creation of visual representations and fine-tune mode parameter using the scripting ability of Miew. Get access to the rich API through the built-in command line. Use mode combinations to emphasize different parts of the structure for further analysis, presentation, etc. 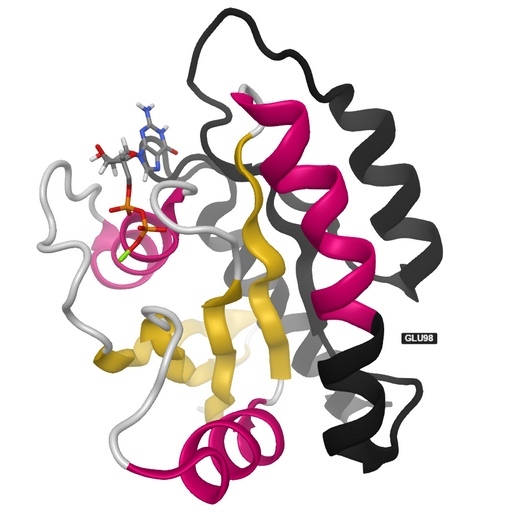 The picture below shows GDP bound Human K-Ras (PDB ID: 4OBE), E98* nonsense mutation is denoted by black. Your customization is encoded in a (long) URL ready to be passed to your colleagues. You can send the link as is, use a third-party service to shorten it, and even generate QR-code. Miew can run in EDIT mode which allows moving and rotating molecules and their fragments. As an example, open public NGB instance, click on ROS1 gene track and select “Show 3D structure” from the context menu. 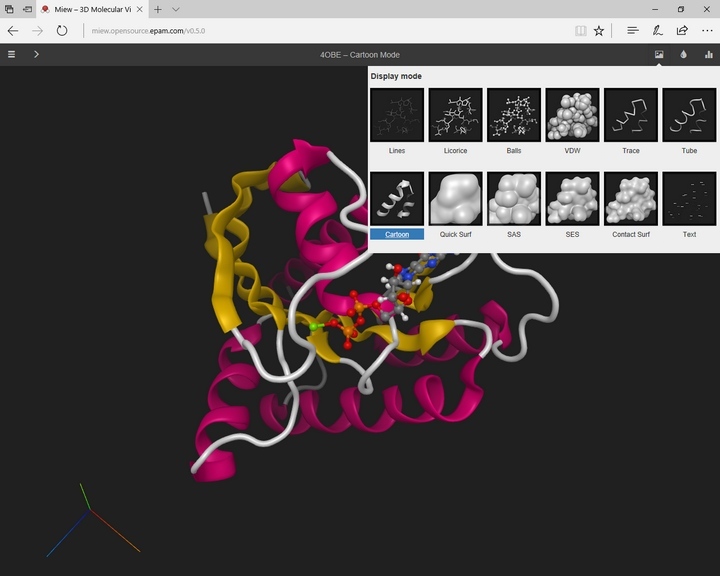 MOLECULAR VIEWER panel appears allowing you to examine the corresponding protein structure. 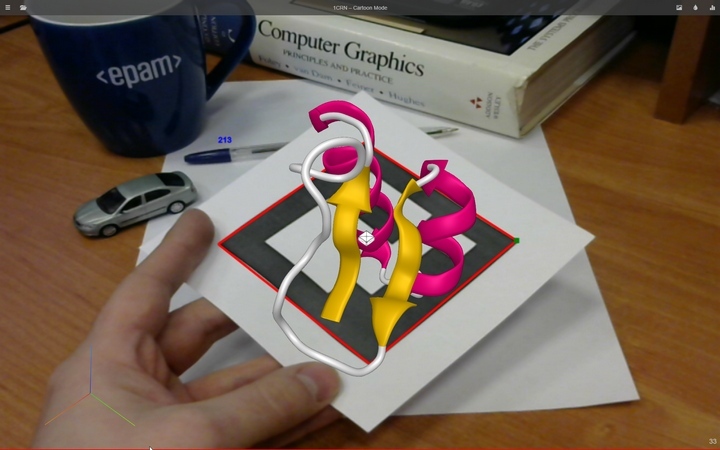 The team at EPAM Life Sciences has also developed VR/AR molecular visualization apps. These modern technologies provide a deeper immersion, thus giving scientists and researchers a better way of studying and analyzing molecular structures. Even a web browser application can take advantage of AR/VR algorithms. Miew source code, documentation, and guides on how to get started with Miew are available at GitHub. Copyright (c) 2015-2019 EPAM Systems, Inc.